Property 11: Beautiful villa in a modern style, with swimming pool, solarium and garden. Property 15: Small, modern beach house on the sand, quiet,sea view, WiFi, aircon, max. 7 p.
Property 24: Wonderful villa with a swimming pool, a courtyard and wide spaces.Ideal place for groups. Property 38: Casa Iride 1 is located in the center of the tiny village of Marina di Ragusa. 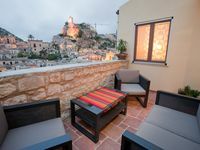 Property 41: Beautifully Restored Heritage Home With A Panoramic View Of Modica Bassa. Property 47: Diana, country villa with pool and panoramic view near the sea, for 7/10 p.
Beautiful large deck, would be great in the summer, but still 20&rsquo;c in November so it was great. Dining table/ board was against the wall in kitchen, so a little bit different. As one of the few places with a washing machine, I would suggest on leaving a note in English on how to use, after the 3rd cycle finally got my clothes (clean though!). Make sure you plan how to get there if you don&rsquo;t have a car.